Only a stones throw off the High Trestle Trail in Madrid is a peaceful spot filled with beauty and talent. Water colors, pastels, blown glass, pottery, textiles and photography can be found here. All are created by local artists. Art House on State has been in Madrid since May of 2015 and is open Friday, Saturday, and Sunday. Classes are available for those wanting to develop their creative talents. 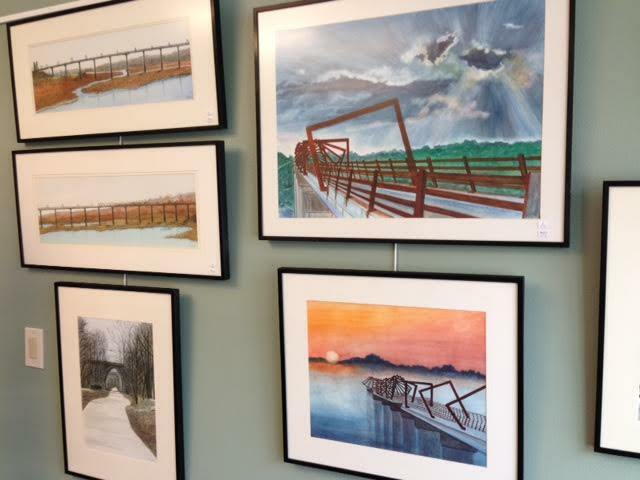 The High Trestle Trail Bridge is the subject matter to numerous pictures and paintings on display throughout the gallery. It's a great place to find a gift for fans of the trail! I enjoyed a quiet break from my bike ride and browsed until I found just what I had been hoping for. 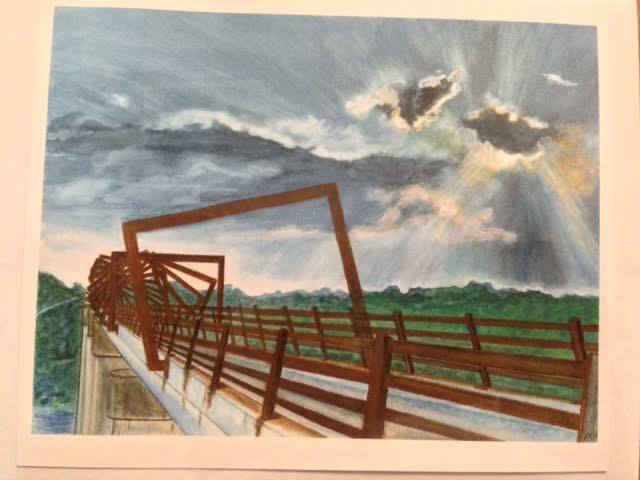 A small picture of the bridge by Terry Dooley. It fit perfectly in my bike bag and will soon be hung on my office wall. Now I can enjoy the High Trestle every day! Take some time off the trail to visit this Madrid treasure. A bit of culture added to a bike ride is always a good thing. 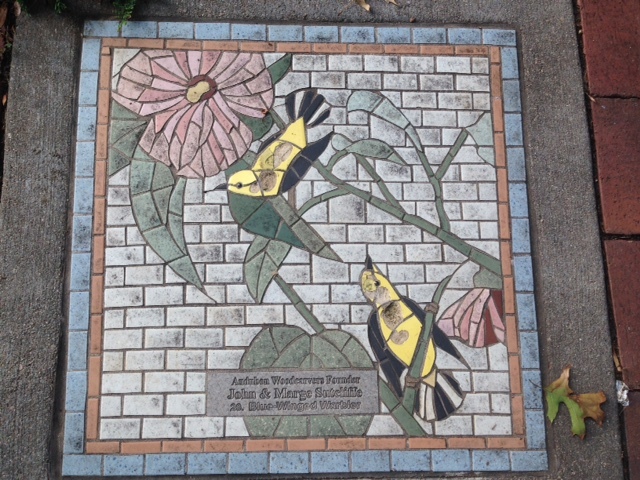 Less than a mile from the T-Bone Trail you'll find the John James Audubon Birdwalk. It's a collection of art honoring the artist, ornithologist and naturalist the Iowa town is named after. 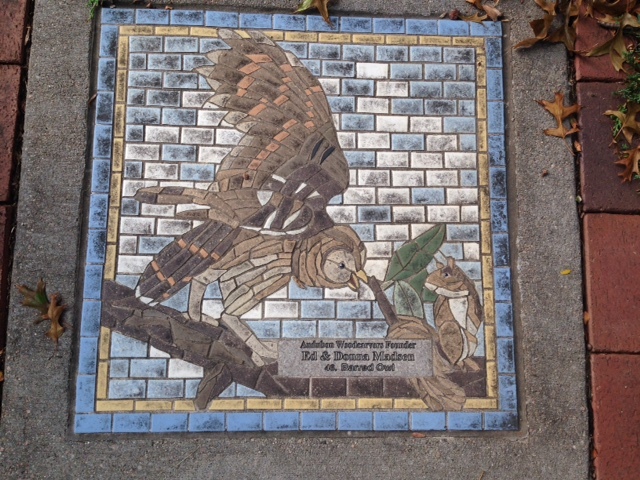 Ceramic tile mosaics are incorporated into sidewalks within the town square and replicate prints from "Birds of America" . I was happy to find the state bird along with a couple of family favorites. 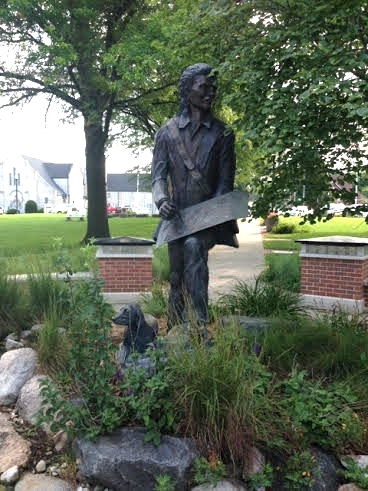 In the center of the plaza is a bronze sculpture depicting Audubon painting while his dog Zephyr rests at his side. Close by is the town's public library. 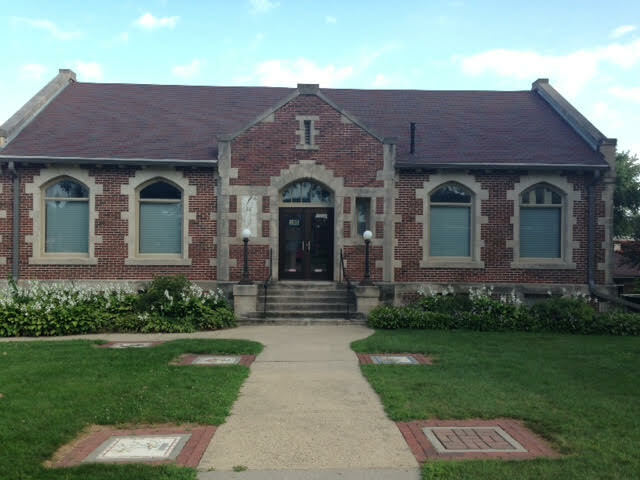 A Carnegie library, the building is a work of art itself and houses books and prints by Audubon. The library wasn't open during my visit but I enjoyed looking at their pretty flower beds. At the corner of Washington and Broadway I found the towering stained glass clock depicting Audubon and his dog. 21 feet tall, the clock is hard to miss! If you enjoy birding, art, or American history, head into Audubon before or after your ride to visit this Iowa attraction. Tucked away in the heart of Altoona there's a breath taking spot to enjoy right off the Vern Wiley II trail. 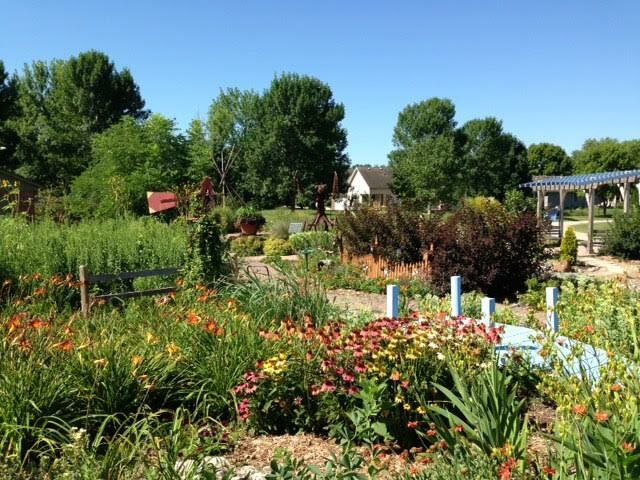 Located at 1050 1st Ave. S the Enabling Gardens is a fabulous barrier-free garden accessible to people of all abilities. The park is free to visit year-round. Plan on spending a good amount of time here. 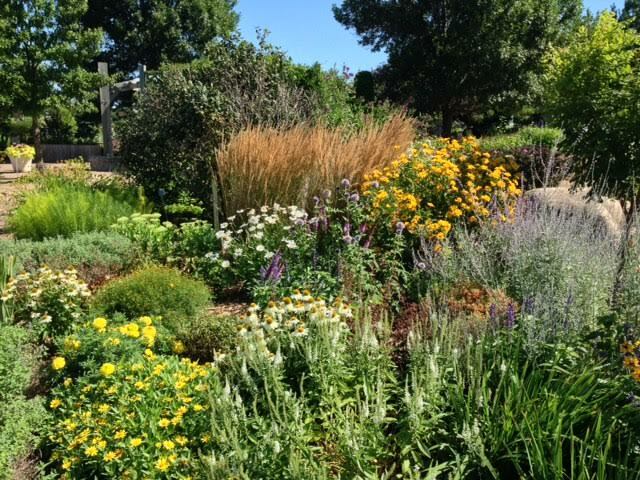 There are so many surprises to find among the beautiful beds. 30 bird houses can be found along with garden art and John Bromell's metal sculptures. My favorites were the gnome garden and the 12 foot praying mantis. A picnic area and garden swing are perfect spots to take a break off the bike. There's also a water fountain for refilling your bottle. 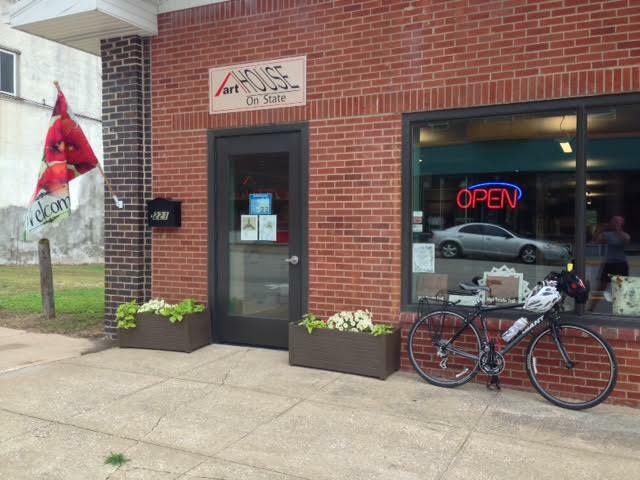 Plan to make a stop at this pretty venue the next time you ride through Altoona. You might even find some inspiration for your garden at home. A perfect spot for cyclists to fuel up is less than a mile off the Raccoon River Valley Trail in Dallas Center. Located in a former hardware store, The Baker’s Pantry specializes in bulk foods. But, don’t let that deter you from visiting on your bike. Along with ingredients needed for baking, there are numerous healthy options for hungry cyclists riding through town. In addition to made to order sandwiches on homemade bread, there’s nuts, dried fruits, produce and snack mixes. So many choices that would fit nicely in a bike bag. On my visit I opened the door and was greeted with the amazing aroma of baking bread. I browsed through the aisles and spotted an item I couldn’t pass up. Homemade elderberry jam!! There was no way I was returning home without some. I also bought a couple of homemade chocolates. Those didn’t make it back to the trail. Delicious! Next time you’re riding through Dallas Center visit The Baker’s Pantry. The store is open Monday - Friday 9:00 - 6:00 and Saturdays from 9:00 - 3:00. Hidden off the bike trail it’s a treasure you’ll want to find!. A block west off the Raccoon River Valley Trail at the end of Jefferson Street is the trail to Hanging Rock Park. 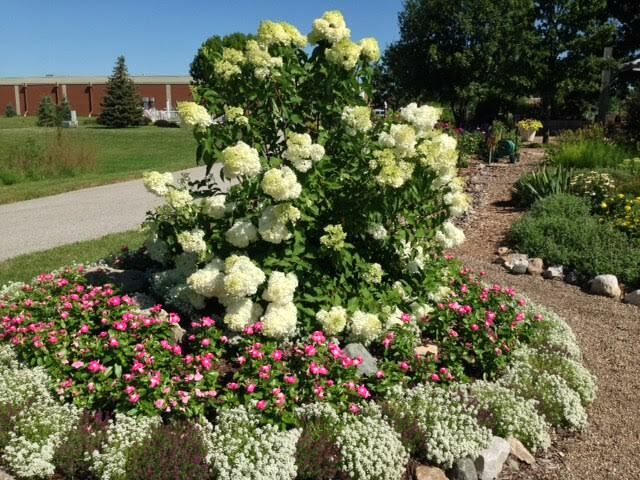 This beautiful park is found on the southern side of Redfield. It’s the perfect location for taking in nature, fishing, picnicking, hiking or using as a cycling trailhead. At the park’s entrance is the former Goodwin farmstead. Robert Goodwin was well known within the Redfield community. He owned the brickyard, served as mayor, was in the US Naval Reserve during World War II and was also an Iowa congressman. Mr. Goodwin’s granddaughter, Ann Hintz, donated the farmstead to the Dallas County Conservation Board to be preserved and maintained. The house is no longer there but the tile dairy barn and equipment shed are. The shed now serves as a picnic shelter and fireplace area that can be rented. Restrooms and showers are also located there. Just west of the barn is a prairie trail and an astrological clock built into the earth. The gem of the park is the riverbank of Middle Raccoon River. The river travels through Hanging Rock Park and is a popular canoeing trail. The sandstone ledges provide not only beautiful scenery for paddlers but peddlers as well. The bike trail conveniently ends at this scenic spot. The stone, beautifully sculptured by nature, the trees overhead, and the river rushing by creates an atmosphere you can’t find anywhere else along the Raccoon River Valley Trail. Next time you’re riding through Redfield, steer your bike in the direction of Hanging Rock Park. It’s a nature-filled treasure with a touch of Iowa history. Park Hours: May - October : 8 am to 10 pm November through April - weather permitting.